Sun., Aug. 7, 2016, 4:13 p.m.
DENVER – Ichiro Suzuki tripled off the wall for his 3,000th career hit in the major leagues Sunday, becoming the 30th player to reach the milestone. Miami players came out of the dugout to congratulate Ichiro, and he waved his helmet to acknowledge the cheers. Hitting coach Barry Bonds gave him a hug as the celebration at third base ended, and Ichiro got another round of applause when he scored on Jeff Mathis’ single, as well as a hug from manager Don Mattingly. Ichiro gave the crowd a wave as he went into the dugout. He batted again in the ninth and drew a walk. 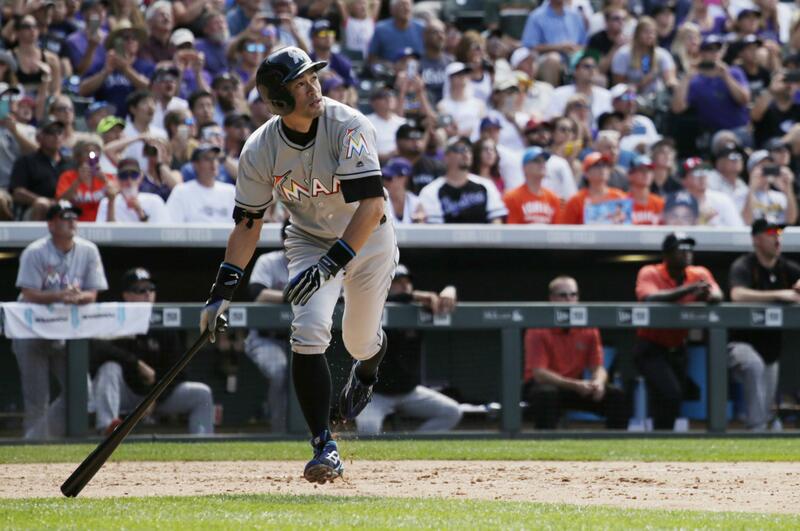 Ichiro was hitless in his first three at-bats of the game before the big hit against Chris Rusin. The Japanese star launched a long drive to right field that carried just beyond the reach of leaping Gerardo Parra. Ichiro breezed into third standing up. Ichiro is in his 16th season in the majors. He got 1,278 hits while playing nine years in Japan before becoming the American League Rookie of the Year and MVP with Seattle in 2001. He was greeted with cheers every time he came to bat. He struck out in the first inning, hit a come-backer in the third and grounded out to short in the fourth. “Congratulations to my friend and teammate Ichiro on joining the 3,000-hit club,” former Yankees star Derek Jeter said in a statement. Ichiro got his 2,999th hit Saturday night as a pinch-hitter. He stayed in the game and grounded out in the ninth. Ichiro played for Seattle until getting traded to the Yankees during the 2012 season. “Prior to Ichiro’s first game for the Mariners in 2001, the late Pancho Ito, a Japanese baseball broadcaster and historian, said, ‘He is a genius with the bat.’ Mr. Ito was absolutely correct,” Mariners chairman Howard Lincoln said in a statement. “A tip of the Mariners cap to Ichiro,” he said. Published: Aug. 7, 2016, 4:13 p.m.